Is Your Ideal Prospect Visiting Your Website? In other words, are your ideal prospects visiting your website each month or is a big segment of your website traffic not relevant for your business? That’s an important question to answer. If your website has low conversion rates, but the majority of your traffic is not from your ideal prospects, then you don’t have a conversion problem. You have a traffic problem. In this article, I’ll show you how to answer this question using simple (no technical knowledge required!) Google Analytics reporting. By going through these reports you’ll gain insight into the characteristics of who exactly is visiting your website. 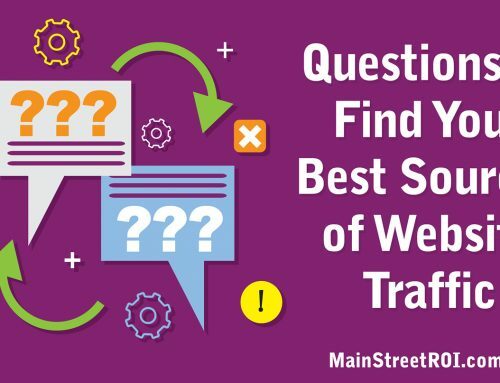 Then you can compare this data to the characteristics of your ideal prospects to see if your marketing is driving the right people to your website. Now, before we get to the reports, there is one obvious step you must complete. What does your ideal customer look like? Is it a man, a parent, a mother, a teenage girl, a college athlete? All of those are much too broad, but they will get you moving in the right direction. Ultimately, the goal here is to create what’s called a customer avatar. For many businesses, you’ll need to create several customer avatars that describe your ideal customers in detail. The more detail the better because you’ll be able to pinpoint your marketing and advertising messages to connect with your target audience. Once you’ve completed this step and you have at least one customer avatar, then you can log into Google Analytics and start reviewing the reports below. The first report to review is called the Demographics Overview report. Go to Audience > Demographics > Overview and then change the date range to view this report. You’ll see how your website traffic breaks down by age range and gender. For example, you may find that most of your traffic falls within the 25 – 34 age range, but how does that compare to the age of your ideal customer? Next, you can dig deeper into these reports by reviewing Age and Gender separately. Plus, you can add Segments to review the reports per marketing channel like Paid Search, Referrals, or Organic (aka SEO) traffic. The next report to review is fairly straight forward. Go to Audience > Geo > Location to review the location of your visitors. Go to Audience > Geo > Language to review the native language of your visitors. Again, how does this data compare to your customer avatars? Finally, let’s take a look at the Interests reports. To understand these reports you must first be familiar with behavioral targeting, or behavioral tracking. As you surf around the internet, the webpages you visit eventually reveal certain interests. For example, if you frequently go to espn.com to read the latest baseball scores, then it’s safe to say you’re interested in baseball, right? Affinity Categories are grouped together in terms of lifestyle and are designed to be similar to TV audiences. In-Market Segments are grouped together in terms of their product-purchase interests. Other Categories are designed to be the most specific, focused view of your users. Go to Audience > Interests > Overview to review which Interest groups are visiting your website. I also recommend clicking into each of the 3 Interest groups to see metrics like visits, bounce rate, and conversions per Interest. Not only will this help you determine if your visitors match your customer avatar, but you can also use this data to launch a new advertising campaign targeting the top performing Interests. On August 20, 2015 at noon Eastern, I’m presenting a step-by-step, Introduction to Google Analytics training. During this live webinar I’ll walk through how to properly set up your Google Analytics account so you can report on your key digital marketing metrics.